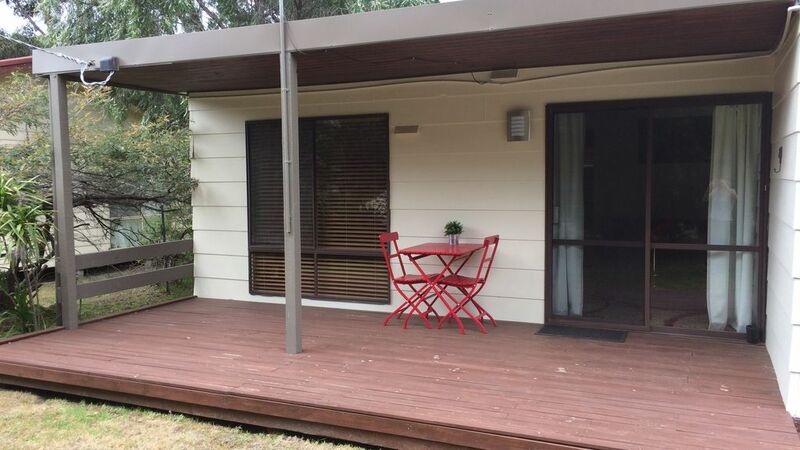 Come along to "Thongalong" a small cottage situated in Loch Sport on the Gippsland Lakes. Don't judge the book by it's cover because this little house has been renovated inside and is clean and modern for a relaxing family getaway. The house is a 2 minute stroll to Lake Victoria and 5 minute drive to the 90 Mile Beach and to the National Park. There is plenty to do while in Loch Sport. Fun on the beach, sailing, jet skiing, wake boarding, canoeing, walks along the beach, tennis court, golf course, bowls club, sailing club, mini golf and more. You can fish at the lake or beach fishing on the 90 mile surf beach. Body board at the 90 mile beach, build sand castles or collect some of the thousands of shells along the surf beach. While all cooking facilities and necessities are included with the house, if you want to dine out, you can visit the local RSL or enjoy the sunset at the Marina Hotel. Please note both venues offer courtesy buses if you want to enjoy a drink. The local "Lodge" or Supermarket is available for all groceries, DVD hire or bottleshop supplies. However, the house is fully stocked with a wide range of DVD's for you to choose from. There is a large 4 car garage which will allow you to store your boat if necessary and a fold up table tennis table is also to be found in the garage. In most months you can enjoy an outdoor fire and will often spot a kangaroo jumping through the garden. Boat and trailer parking available. The house has a TV, Xbox and Wii (with games) in the lounge room, a TV in the master bedroom and a video TV in one of the other rooms. It is a 3 bedroom house all with wardrobes and coat hangers. Master bedroom has a queen size bed, another room has a queen size bed with a single on top and the other room has a set of bunk beds. Doonas and pillows are supplied, so bring your own sheets, doona covers and towels. Washing machine, clothes line, ironing facilities are included. Please note all water in Loch Sport is Tank Water. Pets are welcome but there is no fencing to keep dogs contained. You will enjoy the wide variety of wildlife found in Loch Sport, you will often see kangaroos jumping down the road, echidna's, kookaburra's, koalas, emus and much more. Loch Sport is found 3hrs east of Melbourne near the town of Sale on Lake Victoria between the Gippsland Coastal Park and the Lakes National Park with the famous 90 mile Beach a few minutes away beyond the Lake Reeve Wetlands. Loch Sport is a fishermans paradise and is suitable for a wide range of water sports, jet ski, boating, water skiing, sailing, kayaking and swimming. The Lake is serviced with a Marina, jetties and boat ramps. You can also explore the National Park. The township of Sale is a 40 minute drive where there is an extensive selection of shops, cinema, entertainment centre, museums and Lake Gutherudge. Thongalong offers CLEAN, COMFORTABLE and AFFORDABLE accommodation. PS. Don't forget to bring your thongs along! Cosy Cute Relaxing n Comfy! I love this place! I would live there! Everything you need is there! A home away from home so relaxing! Thanks Carol! Will be back! We really enjoyed our stay. The location is perfect...2min walk to the lake which has a beachfront for the kids then only 5min drive to 90 mile beach! the property itself has a really relaxed feeling and plenty of room for the kids to run around. Highly recommend great value for money. The two of us stayed for a week and found the 3 bedroom property more than adequate for our purposes. The property was clean and welcoming with undercover parking. The modern kitchen/breakfast bar/pantry area is functional and contains all the utensils required. TV & DVD in lounge area appear to be new. Double bed was comfortable. Hot water is provided by 2 large LPG gas bottles - advisable to check on arrival that at least one is full - if not, there is a local supplier to replace at owners expense. Bathroom contains heater lights which are of assistance on cooler mornings. Living area is smallish and there is no dining table or chairs - this may not suit a larger party. We stayed at Thongalong for the Easter Break for the 1st time, had been recommend by friends. It has all the comforts of home, EVERYTHING is there, & great location. The property outside is amazing, heaps of room for all. ( tents ,caravans, cars , boats, jet skis, trailers etc) Large BBQ is provided. The lock up double garage has table tennis but my favourite was the out side fire. Pub has a Mini Bus Service that will come collect and take you home again. Great service & meals there too. We hoping to get back again @ Xmas . We enjoyed our stay at Thongalong. Property was very clean and close to shops and beach.